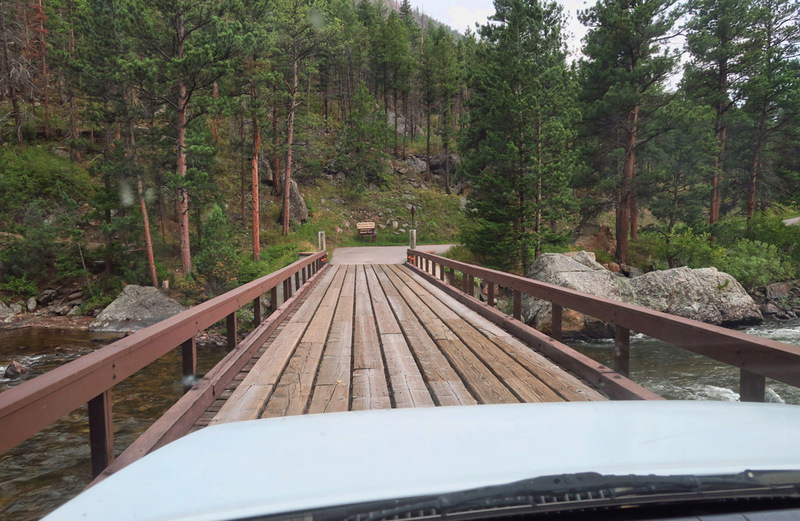 In order to get myself back over the Rockies from Steamboat Springs, I decide to take a more northerly direction up near the Wyoming state line through Red Feather Lakes. It’s a place I know little to nothing about, but have long been intrigued. There’s not much information on the area. In fact, it is a challenge to even figure out which roads are best to take and where to go once I get there. 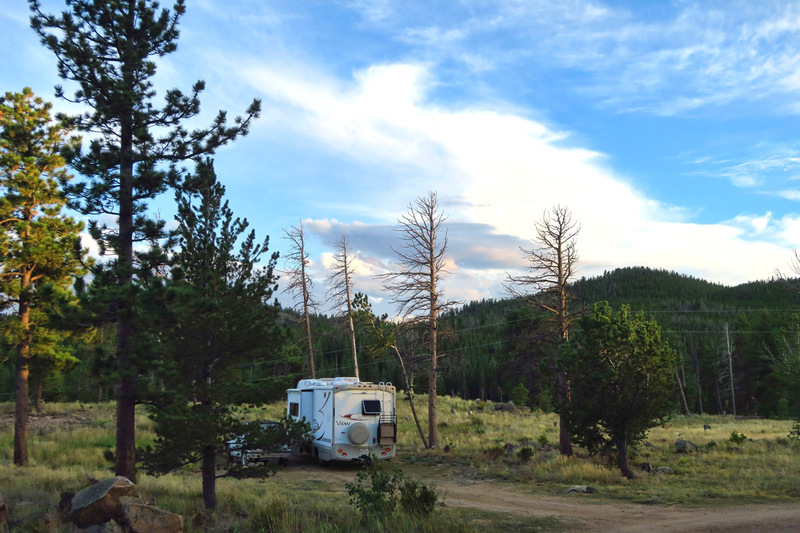 I get by with a little help from my friends…or in this case, friends of friends, who are gracious enough to share coordinates for potential boondocking spots. 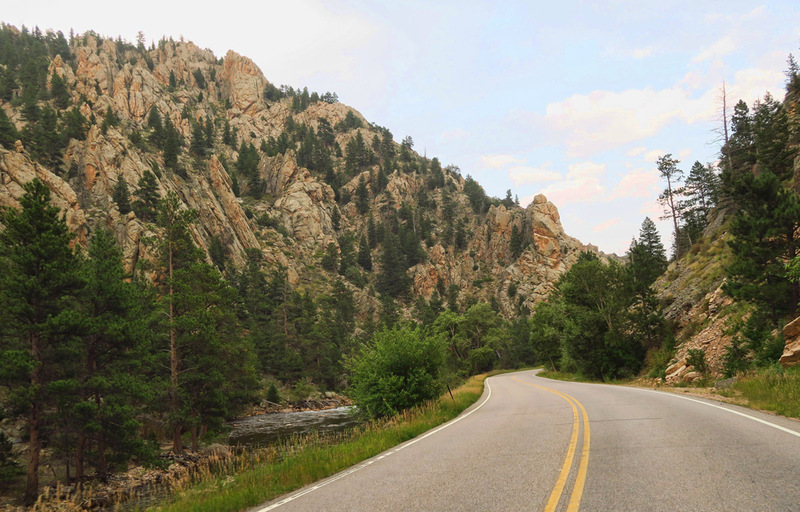 Lots of county roads lead out from Red Feather Lakes Village. Fire rings indicate lots of boondocking opportunities. My lovely spot at Red Feather Lakes, courtesy of Jim and Gayle’s friend Ed. 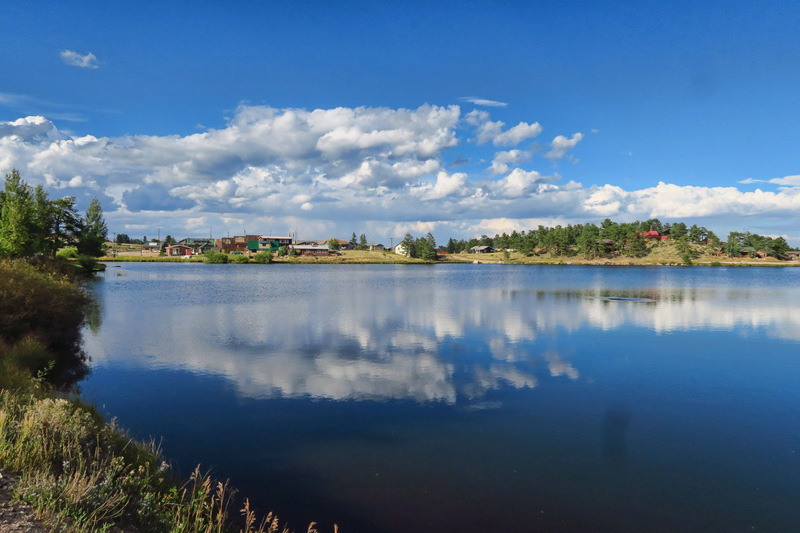 Red Feather Lakes is a small village in the middle of the Roosevelt National Forest. There’s not much there except for a couple of cafes, two general stores, a post office, and once again as I keep discovering in these small mountain towns, a nice library! It’s an area made up of small, placid lakes, some public and others private, requiring a membership to access. Although there are numerous lakes, Dowdy, West, Bellaire, none of them share the same name as the village. Small lakes are present all around the area. Dowdy Lake has a lovely campground. Unfortunately, this windy day brought in a smokey haze. 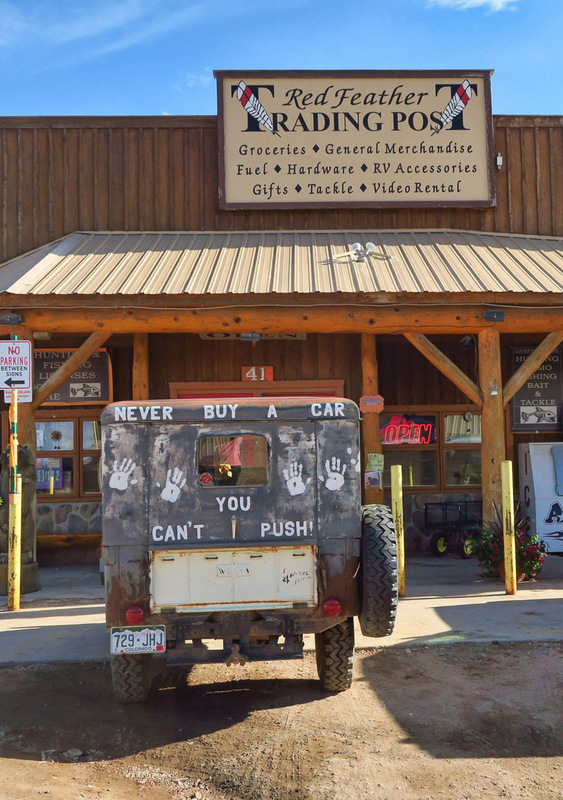 “Never buy a car you can’t push” is the Tracker’s new motto. 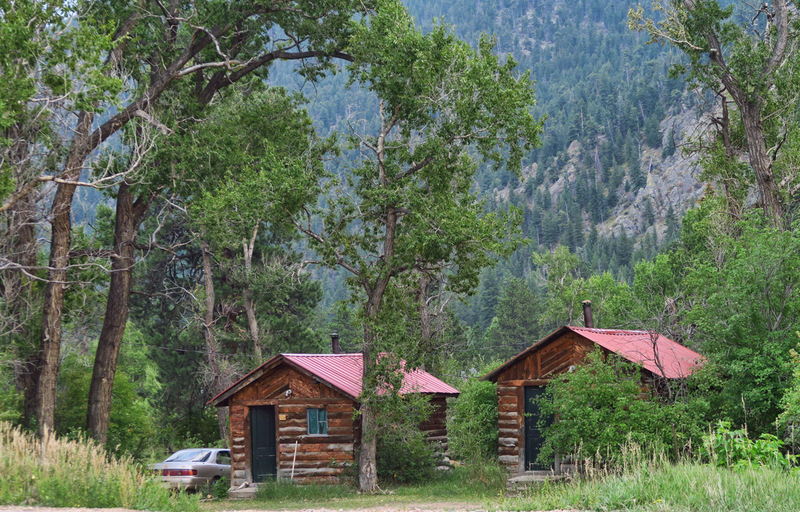 Since Red Feather Lakes area is surrounded by forest, it’s a boondockers haven. County roads head off in numerous directions, many of them marked for camping by stone fire rings. 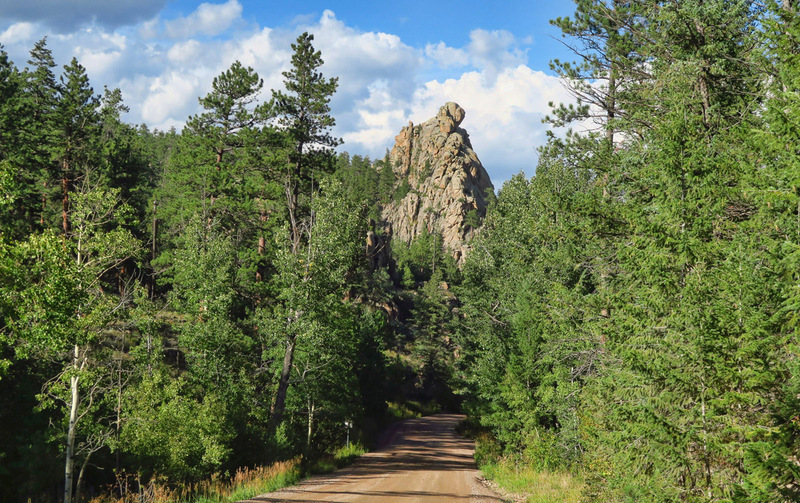 Coordinates lead me to an idyllic, quiet and isolated pull out along the forest service road. As peaceful as it is Monday through Friday, come Friday evening, there must be a hundred travel trailers, horse trailers, ATV trailers, dirt bike trailers, etc. etc. all bumping up the gravel road toward me, some arriving long after dark. 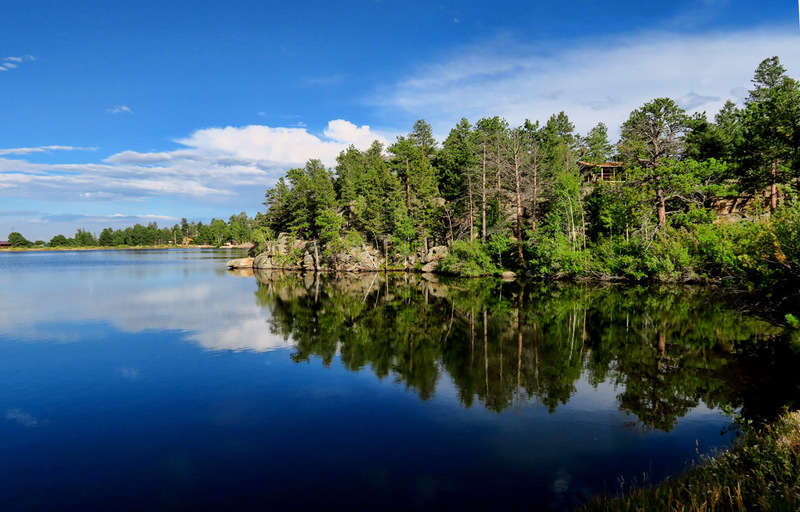 Red Feather Lakes area must be THE weekend getaway for every Coloradoan living along the I-25 corridor north of Denver! 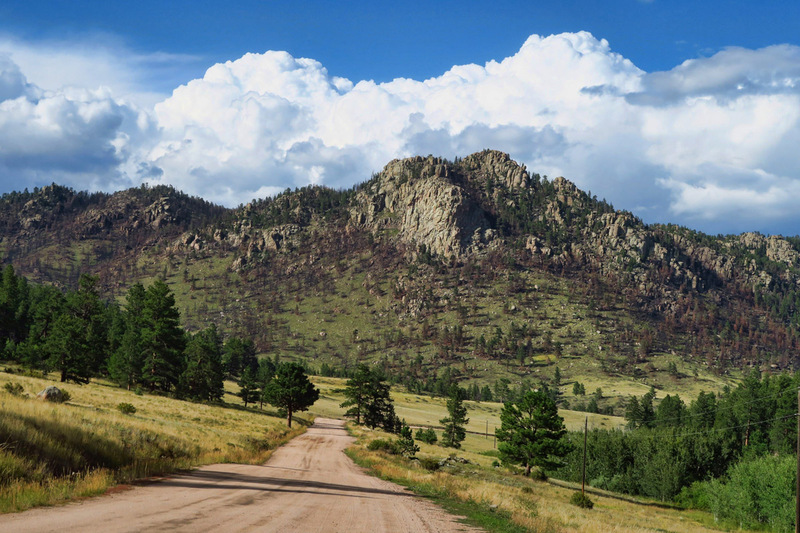 Eleven miles down a steep, pot-holded gravel road leads to the town of Rustic, CO. 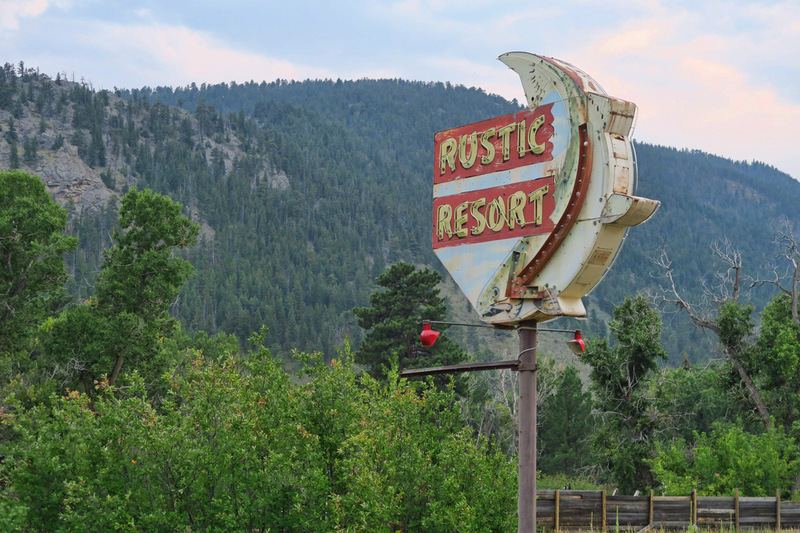 The town of Rustic is little more than a General Store and cabins along the Cache la Poudre River. 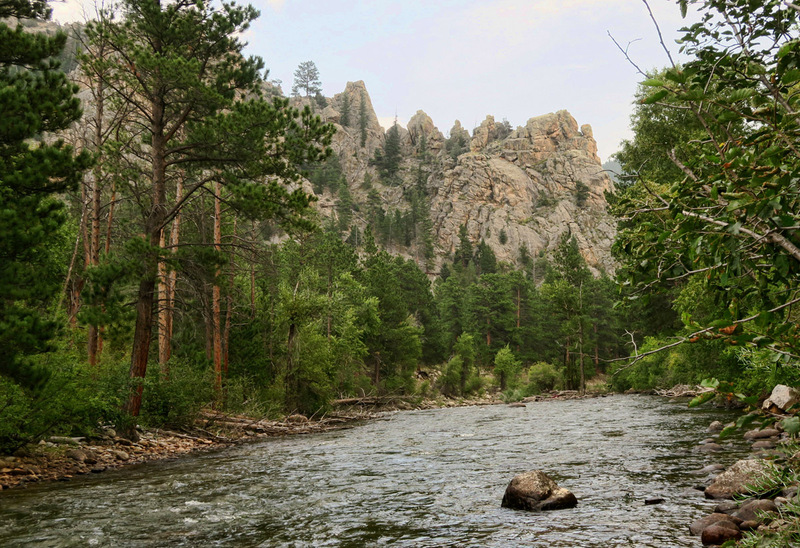 The Poudre River is Colorado’s only river to receive the “wild and scenic” protection under the National Wild and Scenic Rivers System. 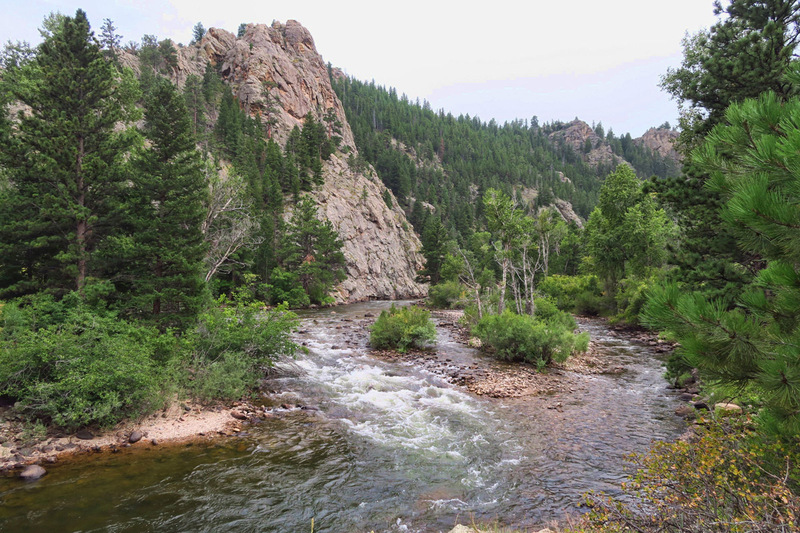 CO Hwy 14 runs through the Poudre River Canyon, and follows alongside the river with many turnouts for trout fishing. 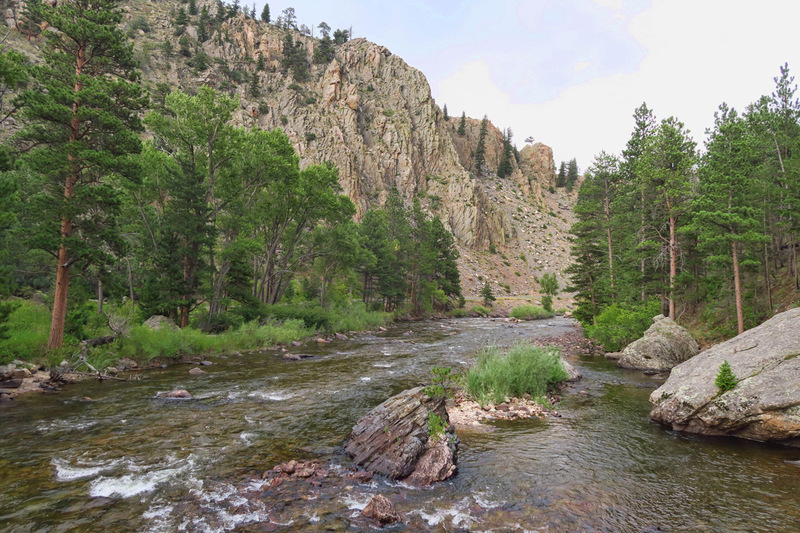 There are quite a few Forest Service Campgrounds right alongside the river. The problem is none have cell signal, and there is little else to do there if one is not a fisherman. 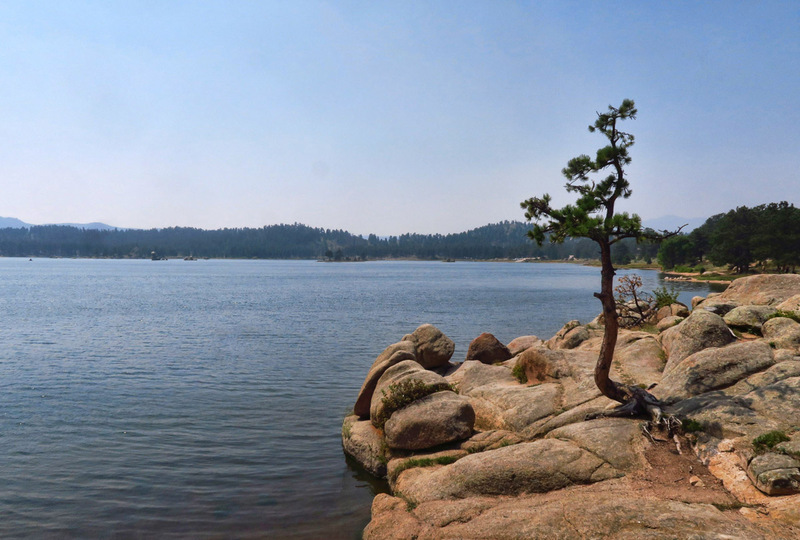 But there’s another reason I want to visit Red Feather Lakes. Returning from my year long backpacking trip on the heels of 9/11, I relocated to Atlanta for a job with American Express’ competitor. It was a big job…my biggest yet as a Director of Product Development with a team of eight managers reporting to me. I reported directly into the SVP, which in this case stood for Sociopathic Vitriolic Person! It was a difficult time in my life, but having just saddled myself with a 30 year mortgage in a declining economy, I couldn’t quit. Waking at 4:00am in a cold sweat, I began seeking anything that would soothe my frazzled nerves and quiet my frenetic mind. 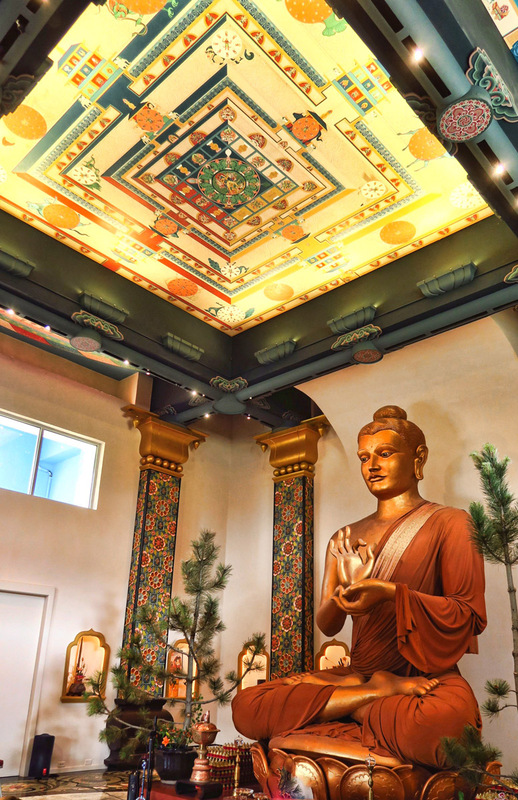 In searching out distraction from my stressful situation, I began to visit the Atlanta Shambhala Center, based on ancient Tibetan Buddhist teachings. It gave me a much needed calming distraction and immersion in a like minded community. It also helped me tap into the little used creative side of my brain, as I attended classes in the contemplative arts; writing, flower arranging (Ikebana) and yes, even meditation, all with the purpose of focusing on compassion and basic human goodness, something I was sorely lacking in my career. Shambhala Mountain Center’s beautiful bookstore. 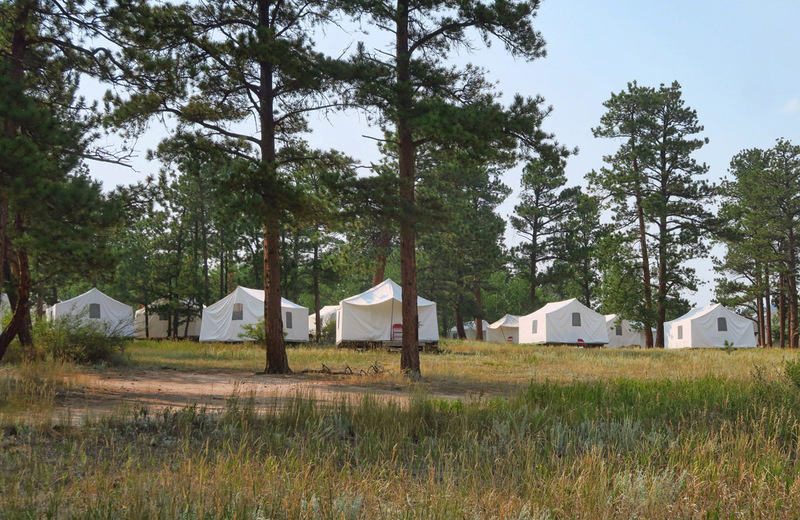 Guests attending retreats have many options for housing, one of which is platform tents. Kyudojo Archery Center. Impossible to see in this photo, but there is a deer taking a nap beneath the shelter in the shade! I ponder the irony of how safe she seems to feel in an archery pavilion. 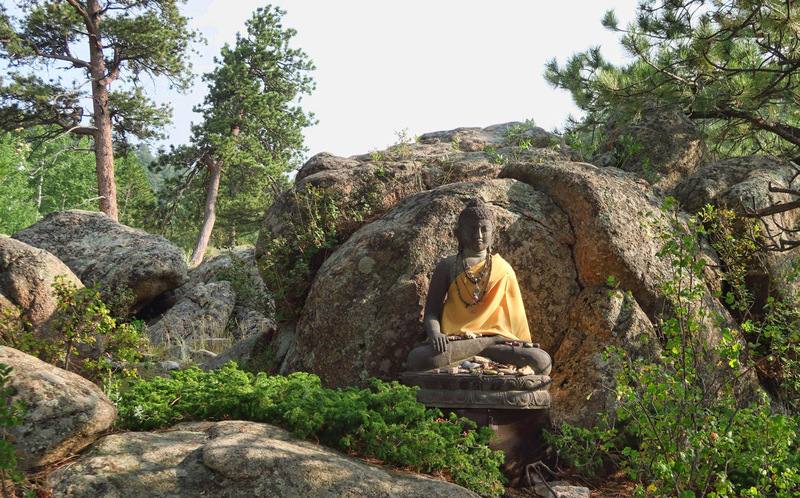 While at the Atlanta center, I heard often about the Shambhala Mountain Center in Red Feather Lakes. 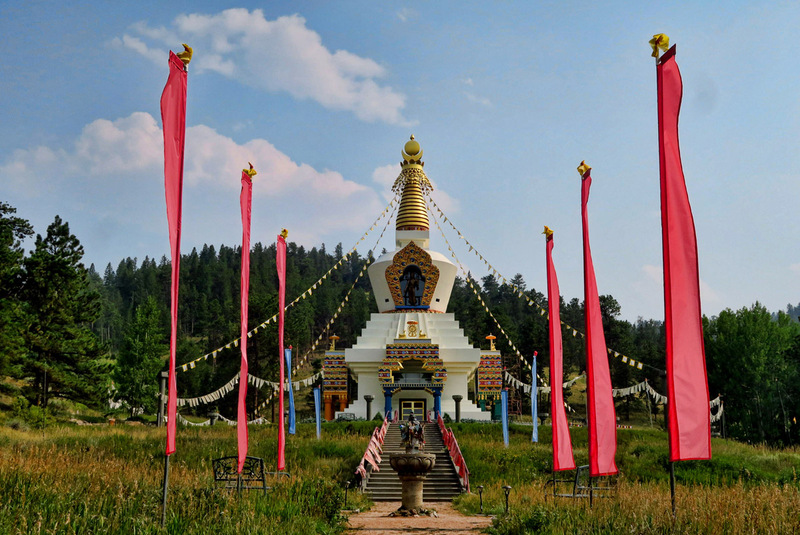 Located on 600 acres in the middle of nowhere, I have always been curious to visit the campus, as it is also the location of the Great Stupa of Dharmakaya, which has been visited by the Dalai Lama himself. 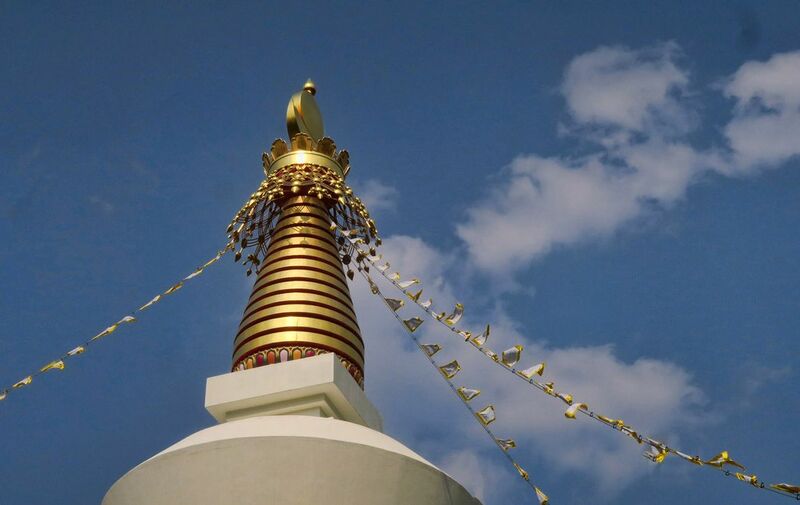 Completed in 2001, the 108 ft tall Stupa took thirteen years to build, and is considered one of the most significant examples of sacred Buddhist architecture in North America. 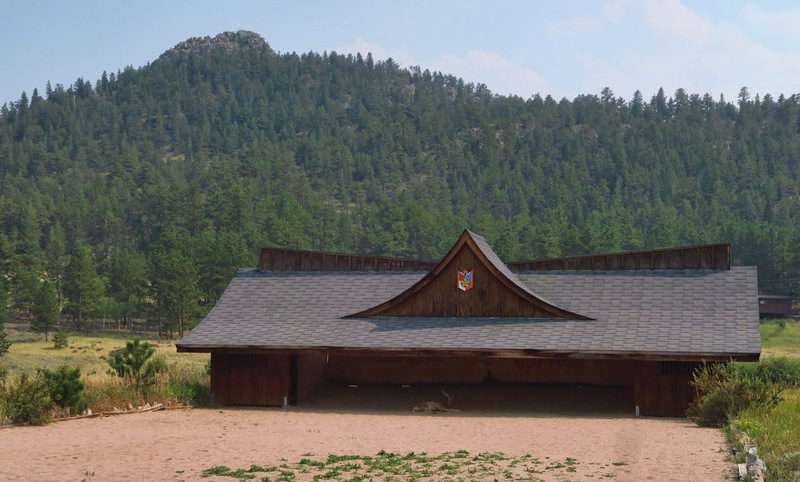 The center itself offers workshops in everything from hiking retreats, writing retreats, yoga retreats, all centered around contemplative focus through meditation and mindfulness…quieting the mind of daily noise and chaos so creativity and compassion can enter. 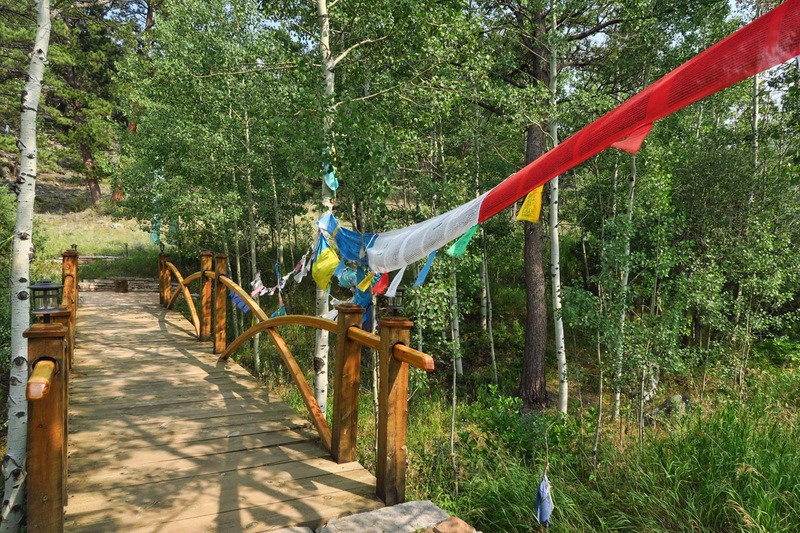 Bridge lined with Tibetan prayer flags along the path leading to the Great Stupa of Dharmakaya. Stop along the path up the hill. It’s a lovely 20 minute hike up from the center to the stupa. Its presence upon approach is impressive. There is a visitor center next door that shows a 25-minute video on how the stupa was built over the 13 year period. 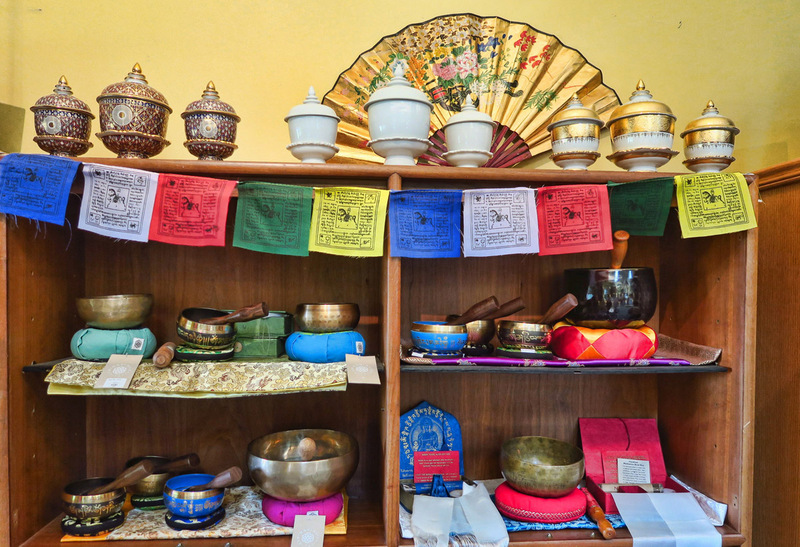 Although I have never mastered the art of quieting my monkey mind through meditation, I respond to surroundings at the Shambhala Mountain Center like Pavlov’s dog. The clear resonating tone of the meditation bell, the sound of prayer flags fluttering in the breeze, the act of removing my shoes to feel the cool tile on the bottoms of my feet, all sensations that instantly evoke a sense of inner calmness. My walking pace slows down. My thoughts become more measured. And the most simple of tasks become deliberate and contemplative as I am reminded with every breath to express gratitude for my every blessing. I find comfort beneath the Tibetan prayer flags covered in written prayers, the premise being they are released in the wind to spread good will and compassion to all. 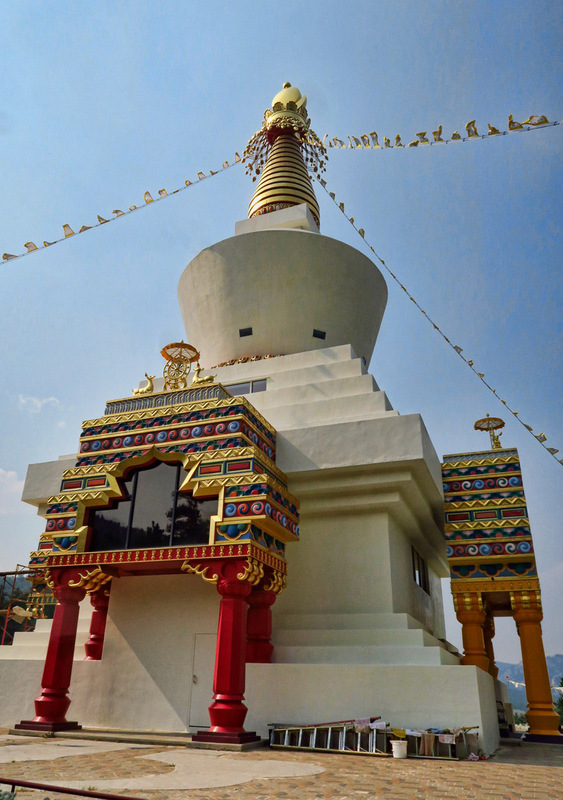 Unlike most stupas in Tibet and Bhutan, this one is open to the public. The inside is beautiful. 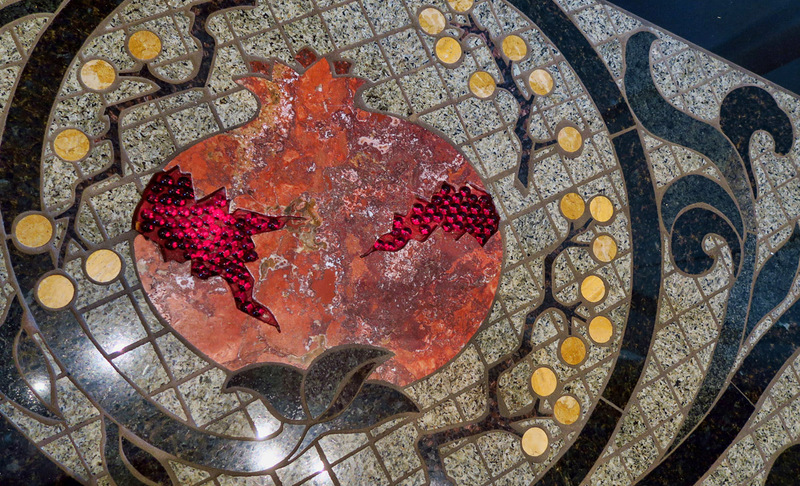 Floor is covered with inlaid tile, this a pomegranate with red marbles as the seeds. 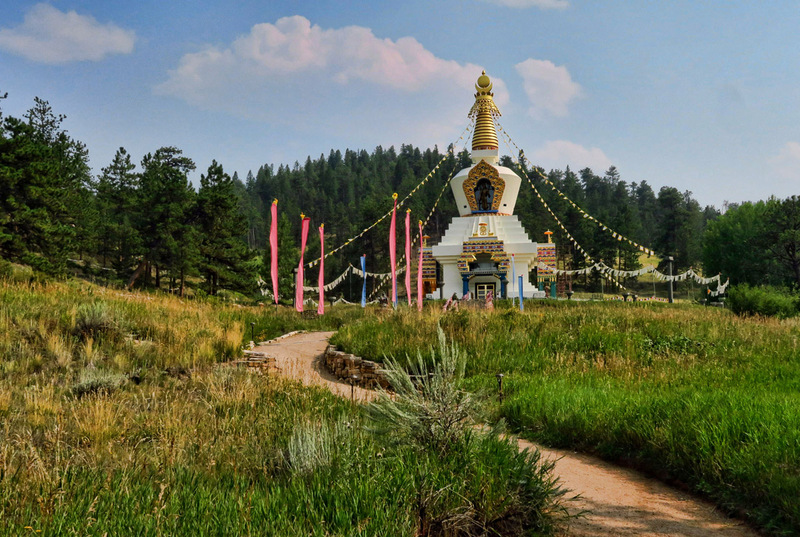 This entry was posted in Colorado and tagged Dowdy Lake, Great Stupa of Dharmakaya, Poudre River Canyon, Red Feather Lakes, Shambhala Mountain Center by Suzanne. Bookmark the permalink. An awesome find in your wanderings. It is why I so envy your life travels. The stupa is just stupendous. What’s next after CO? WHAT AN AWESOME SPOT! I needed to read this post today to become grounded again. Selling two houses of furniture and all that goes with it has indeed taken my calmness down a path that I cannot find right now. Your friend Marie from Guanajuato stopped in at the sale yesterday. She is an interesting person. I have a place for you in December/January if you are coming back down. It has just become available, is in Col. San Antonio and is adorable. It is not my place, but a friend’s place and I immediately thought of you! That is just awesome, the Buddha is just stunning as is the scenery of the retreat. Love your posts! There are hidden gems all over, one just has to find them. So glad you did. The quote at the end of your post is most powerful. 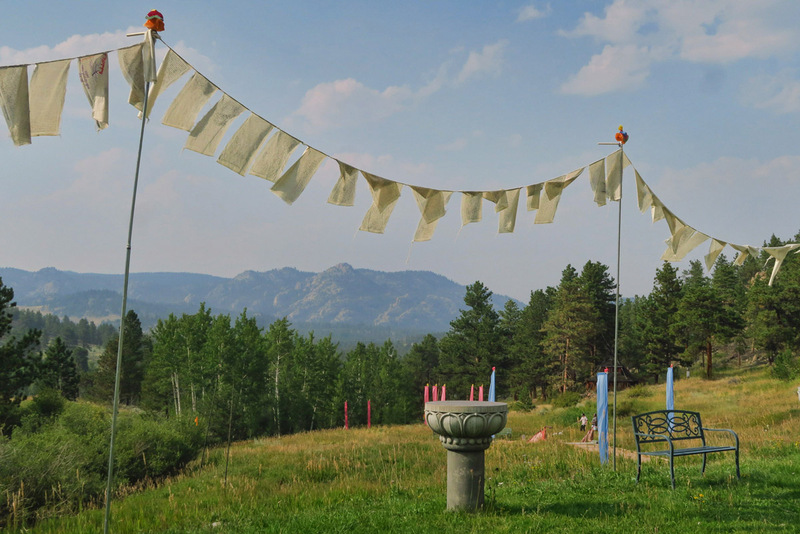 The Shambhala Mountain Center looks like my kind of place. I will definitely add it to my travel list. Although I always find your photos to be quite lovely, this series of images are stunning. The clarity is amazing! Did you take a kyudo lesson or three?